Since 2007, Reguliers.net is the most complete and up-to-date website about the most famous Amsterdam gay street: Reguliersdwarsstraat. On this website you'll find everything about the gay venues, the other bars, clubs and restaurants, the rich history, the buildings and the people of this colorful street. In the eighties, Reguliersdwarsstraat was the first place in Europe where both gay and straight people partied together in a very open and creative atmosphere. Today Reguliersdwarsstraat offers the widest range of gay and straight venues: from big trendy gay bars, to the most famous Amsterdam Hiphop bar; from typical dutch cafes, to the finest foreign restaurants. For foreigners, Reguliersdwarsstraat is a rather long and difficult name. The last part (straat) just means street, and the first part sounds like Raygoohleers-dvars. See also more about the meaning of this street name. 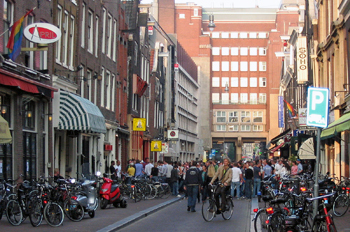 - Kerkstraat (at a 5 minute walk), which is the oldest gay street with some hotels, a big new bar and a popular gay club. 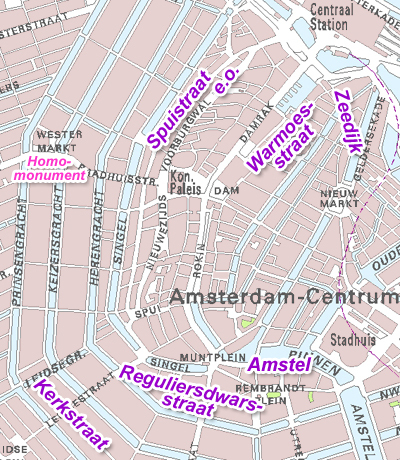 - Amstel area (5 minute walk), with a wide variety of typical dutch gay bars, some very old, some new. There's also a small trendy gay club. - Warmoesstraat/Zeedijk area (20 minute walk), where you can find the leather scene and also a few traditional dutch gay bars. More information: see the general gay guide websites. Parts of the texts and the own photos of this website may, within the limits of the law and reasonableness, be quoted with reference to the source and if possible a link to www.reguliers.net. If in doubt, contact us via the address below. This website has been compiled with the utmost care. Nevertheless, certain information can no longer be current, complete or correct. Reguliers.net is not liable for any consequences. For works of third parties, we have tried as much as possible to mention the name of the entitled party or to find out. Those who still think they can still assert certain rights, are requested to contact via info@reguliers.net, after which the correct credits will be mentioned. For statistical purposes and for the use of some external services, cookies are placed on your computer from this website. By visiting this website you are deemed to give permission for this. No visitor data is stored via these cookies.